Yesterday, I spent a good portion of the afternoon catching myself looking out the window. Our view right now is nothing spectacular – Atlantic Avenue in all its glory, a Trader Joe’s across the street. But the sunsets, people, the sunsets!! We see such an expansive swath of sky in our Brooklyn home. I realized I’m going to miss this view starting in a few days. By Friday afternoon, there’ll be a different view. Kensington, we’re coming – hope you’re ready. Our soon-to-be former home is ready to be rid of us. In the last three days, I’ve lost three out of four light-bulbs in the kitchen, and since they’re those expensive $9-a-piece affairs, I decided I’m not spending money on something for just a few days. The third light went out yesterday morning, the day after I finished testing recipes in this kitchen. Even the kitchen wants us out, I thought. It’s time. With six recipes left to go I figured I could definitely make them in the next few months even with my kitchen being out of commission for a few weeks. In the meantime, I can focus on getting a lot of writing done for the two books. I’m looking forward to hunkering down. We move this Friday, which is also winter solstice, i.e. the shortest day. I look at it as a good omen – things can only get better from here. Days will be longer; we’ll be settling into a new space; we get to explore and bond with a new neighborhood. The day that we closed on our new home, we did a final walk-through in the morning. I looked at the kitchen, not yet realizing the scope of work that we would eventually decide to do. I peeked in the kitchen and inside the fridge. And then I realized that with the kind of rigorous recipe testing that I’ll be doing, the size of the fridge wasn’t going to do it for us. We needed something bigger. And so while hoping not to have to buy appliances, we sort of fell into that rabbit hole. As soon as we saw what is now about to become our new home, we knew we had to do some work on the kitchen. We knew it was not a good time for us to do any kind of renovations, we’ve all but depleted our savings, but the kitchen was oddly constructed, with a weird half wall separating it from amazing space deemed as the “breakfast nook”, which we instantly saw as the continuation of the kitchen. We decided that doing this at the onset was going to be less difficult and also would make working in the kitchen much more rewarding in the long run. Since we already had a designated “dining” area, the breakfast nook seemed unnecessary – we could eat breakfast and dinner in the same spot and be fine. 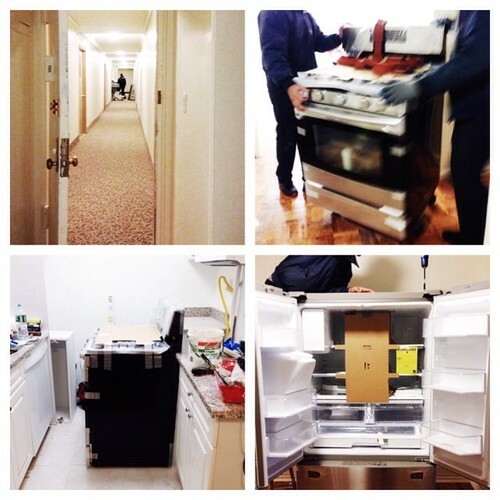 What we really needed is to expand our 54 square foot kitchen to something bigger and better. Because we were expanding the kitchen, we would be expanding countertop space. And because of that we wanted to have the same kind of countertops throughout. Since I had no love for the pink and grey polished granite, we realized we had to get a new surface all together. And because we were going to build new cabinets in the expanded area, it was probably going to work better (and be better use of space) to use new cabinets from the same place all throughout the kitchen (plus it would have the uniform look). 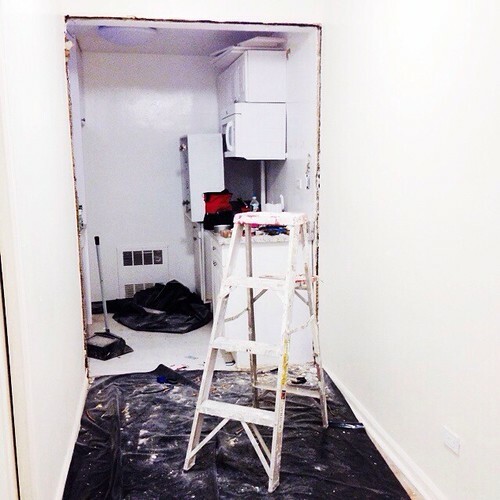 We knew we wanted to go with Ikea cabinets – after doing a lot of research and reading a bunch of renovation blogs, particularly posts focused on kitchen renovations, Ikea seemed to be the only sensible choice. The price and quality seemed right. I looked at some other cabinets and really didn’t care for them – besides, they were made out of the same material as Ikea cabinets but cost several times more. No thanks. To get the ball rolling with cabinets, first you need to make sure you have your appliances picked out because the contractors will measure your kitchen, take into account your appliances’ dimensions and then build you a design based on that. After doing a lot of research, checking prices, reading customer reviews, Consumer Reports articles (can we just for a second talk about how I can spend hours reading those reviews – is there something wrong with me?? ), and various other web research, I found an appliance sale at Home Depot. I had a certain budget in mind, so when I was reading Consumer Reports reviews, it was for a fairly basic, but spacious enough fridge, with energy star compliance, good reviews, solid reputation. I had settled on a certain Samsung model that had very good ratings from the magazine and customers. But the Home Depot sale threw me off. The Samsung fridges I was looking at were going for 40% off which meant that we either bought a fridge we initially liked and saved a ton of money, or we got a slightly better fridge because with 40% off, it was now much more affordable. The slightly better fridge, was actually a lot better and not much more expensive – the discount still placed it firmly in our budget. What I liked about it over the initial model was the external ice and filtered water dispensers. Instead of having to open the freezer to get the ice (or the fridge to get the water), we could do this without letting the cold air escape. One of the reasons food spoils faster at home is because of this constant opening and closing of the fridge and freezer. And yes, we’d be doing that a lot anyhow, but decreasing that a little bit would be better for preserving food and fridge/freezer efficiency. And then… I spied a range that was also on sale – 30% off. It had a fifth large burner that would be ideal for large pots and a griddle. It’s BTU situation was lightyears ahead of our current stove/oven and I kind of just fell for it. It was also a Samsung and got very good reviews everywhere I checked. I decided, screw it, we’re replacing countertops and they’ll fit the new stove better than having to wedge something eventually into that spot. 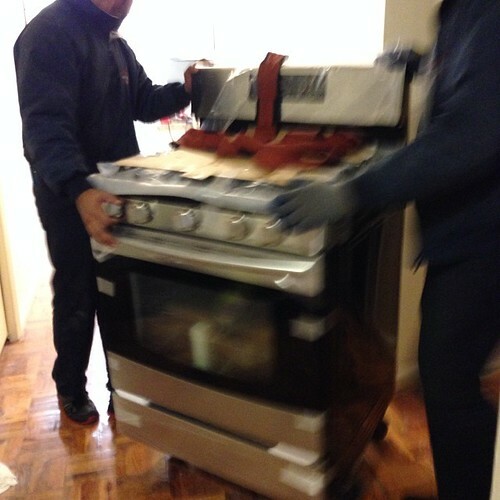 You might be wondering what happened to the appliances already in our kitchen. In a deal of a century, I negotiated with our super that he take our old appliances (which were brand new) in exchange for the demolition of our half wall in the kitchen (and repair of the remaining wall/floor) that separated our kitchen from the “breakfast nook”. Our new super got new appliances he needed and wanted; and we got our wall knocked down, which meant we were ready for Ikea experts to come and measure our kitchen and make a plan. With our appliances picked out, we were ready to start designing our new kitchen. P.S. The appliances were delivered, but since the kitchen is going to undergo serious renovations and currently the appliances don’t fit, the range is in the middle of the kitchen (as you can see) and the fridge is plugged in but is in the living room. So it’ll be a fun living for awhile. P.P.S. Also, for any of you who buy appliances, even on sale – ask for an additional discount. I said to the Home Depot guy on the phone, “Look, I’m spending a lot of money here, are there any additional discounts or coupons you can give me?” And he came back with another $100 off. If you ask, the worst thing you can hear back is a “no”. So always inquire – who knows, you might get another discount! Love hearing about your thought process–sounds like you are off to a great start! Good advice! :) Glad you got the appliances you wanted and on a family friendly budget. Also, I think it’s worth a mention that Home Depot credit card (if you have one or open one – I am not a Home Depot sales person btw) offers either 0% financing or additional % off when you purchase, and some neighborhood Home Depot’s also offer additional % discounts on top of everything to cardholders – so always worth asking! david – thanks for this sage advice – sounds like you’ve been there :) quick question, would it make sense to reorder hinges and stuff once we take stock of what has been delivered and is missing? or is there something in particular. I figured, one day, we’ll upgrade to better doors? I am so excited for you guys! New house and a newer kitchen! Yahoo! Thanks for detailing the renos, by the way. As a lifelong renter (so far) this seems incredibly daunting, so I appreciate you sharing your experience. Good luck with the move, and hopefully the rest of it is smooth sailing so you can get that fridge back into the kitchen ASAP! Welcome to the neighborhood! It’s lovely here and a refreshed kitchen is just the way to settle in. Our’s took forever since we did it ourselves, but it was well worth it. Alyson – thank you, and if I don’t answer some questions, please ask away. This is a learning process for us too! deda – thank you! we’re looking forward to settling in. because we’re both busy and i need a kitchen to work in asap, we’re leaving the work to professionals – hopefully they’ll do it in less time! Trader Joe’s across the street? OMG! That fridge is amazing! Good luck with settling in and your new kitchen! whimsy2 – i know :( we’re going to miss it. it was great being near it all this time. I love it when you talk ‘appliances’. I feel like I should be smoking a cigarette now. Gail – exactly. I feel like post appliance talk is cigarette talk! Yesterday, our cable guy and I talked for 30 minutes about cooking turkeys (the techniques and tricks) – same thing! Finish touch of every product is really appreciable. I am planning to renovate my kitchen this season and I am thinking of adding some modern appliances which will make my kitchen smart. Yes! The appliances will also help me to cook delicious food faster and serve my guests. Kevin – congrats – and if there is anything in the post that I didn’t highlight and you have additional questions, please leave an additional comment (that way other readers with similar questions will see your question and my answer). Good luck!